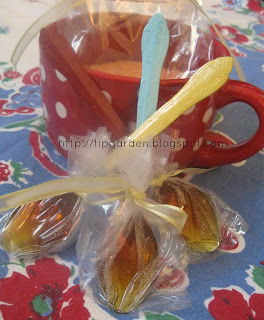 Making Vanilla infused sugar is an easy thing to do and makes a wonderful addition to any coffee or tea gift basket! Perfect for Mothers Day! Perfect addition along with my honey lemon spoons! They make a lovely addtion to a gift basket! It is super easy, lets get started. There are two ways to make it, I'll share both with you. First there is infused. This is where you let pieces of the Vanilla Bean Steep in the sugar and you shake it around every few days. You can remove Vanilla Bean after 2 weeks. the other is Mixed. I have not made this version so if you do, I'd love to get your feedback. Using a coffee or nut grinder, Grind up the Vanilla bean into a fine powder. Mix it in to the sugar where it stays with the sugar and gets stirred into the tea/coffee directly. Jan's Tip: You'll want the vanilla to infuse for about 2 weeks prior to use, so make this gift ahead of time so it's ready to go. In a half pint (1 cup ) Mason Jar pour 1/2 cup white sugar. Push 1 piece of vanilla bean into the sugar. Pour another 1/2 cup sugar on top, to within 1/2 inch of top of jar. Push 1 piece of vanilla bean into the top 1/2 of sugar. Repeat with remaining jar and ingredients. Let steep for 2 weeks, shaking sugar every few weeks. remove Vanilla Bean pieces before using. In Coffee Grinder, grind up the Vanilla Bean into a fine powder. In a mixing bowl, mix together 2 cups sugar with ground vanilla bean. Pour into 2 half pint canning jars. Seal with an airtight lid.